“It has been a very long journey to make this day happen and so many have given their support. 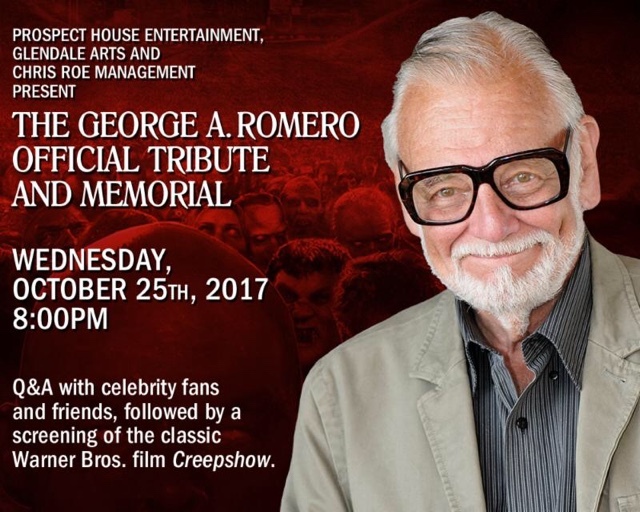 With George’s star ceremony on Hollywood Blvd., the reception that follows and the well-deserved tribute that evening at the Alex Theatre in Glendale, there is no doubt that October 25, 2017 WILL be the DAY OF ROMERO in Los Angeles,” commented Chris Roe, Manager of George A. Romero & Director of the Romero Star Campaign. Below is the artwork for The George A. Romero Official Memorial and Tribute. Additionally, below is a link to the Alex Theatre website to purchase tickets for this event. Hollywood Walk of Fame Information As a condition of being considered for and subsequently issued press credentials for the Hollywood Walk of Fame ceremonies, your outlet has agreed to abide by the following restrictions: No portion of the Walk of Fame Ceremony presentation may be rebroadcast or live streamed or used in any medium whatsoever, including internet, prior to the conclusion of the live ceremony. The Hollywood Chamber of Commerce is proud to announce that filmmaker George A. Romero will be honored posthumously with the 2,621st star on the Hollywood Walk of Fame on Wednesday, October 25, 2017 at 11:30 a.m. PDT. The star will be dedicated in the category of Motion Pictures at 6604 Hollywood Boulevard in front the Hollywood Toy & Costume Store.“The fact that fans nominated Mr. Romero for the Walk of Fame star speaks volumes of how loved he was for his work in the horror film genre and for being the person he was. Fortunately, prior to his passing he learned that he was selected for a star, and we are saddened that he won’t be here with us for his special day,” stated Ana Martinez, Producer of the Walk of Fame. Helping Emcee and Hollywood Chamber President/CEO Leron Gubler to unveil the star will be guest speakers: Filmmaker Edgar Wright and special effects make-up artist Greg Nicotero. Accepting the star will be Romero’s wife Suzanne Desrocher-Romero. Born on Feb. 4, 1940 in New York City, Romero became interested in filmmaking at a young age when he borrowed an 8mm camera from a wealthy uncle. Inspired by Michael Powell and Emeric Pressburger’s musical opera, “Tales of Hoffmann” (1951), Romero began making his own short films and was arrested at 14 years old after he threw a flaming dummy off the roof of a building while making “Man from the Meteor” (1954). While attending Suffield Academy in Connecticut, Romero made two 8mm shorts, “Gorilla” (1956) and “Earth Bottom” (1956); the latter being a geology documentary that won him a Future Scientists of America award. After graduating high school, he attended Carnegie-Mellon University in Pittsburgh, PA where he earned his Bachelor’s in Art, Theater and Design in 1960. Romero continued making shorts such as “Curly” (1958) and graduated to 16mm films with “Slant” (1958), both of which he made with sometime collaborator Rudolph Ricci. Following work as a grip on Alfred Hitchcock's “North by Northwest” (1958), Romero shot the feature-length “Expostulations” (1962), a satirical anthology of loosely-connected shorts that showed hints of his later social consciousness. After forming the commercial and industrial production company, Latent Image, in 1963, Romero cobbled together $114,000 in order to direct his first feature film, “Night of the Flesh Eaters.” Renamed “Night of the Living Dead” (1968) after landing a distributor, the unrelenting film - which was criticized at the time for its onscreen excesses - became a landmark cult film and significant social barometer that forever changed the horror genre. With no heroes or redemptive meaning - only unstoppable nihilistic evil rampaging through small town America - the movie popularized the zombie apocalypse subgenre of horror, spawning numerous imitators throughout the ensuing decades. Though decidedly cheap in production values, “Night of the Living Dead” nonetheless stood the test of time as an innovative cult film that attracted new fans every generation and became Romero’s signature work. Romero secured his cult status with two remarkable films: “Martin” and “Dawn of the Dead”. He later went on to write “Day of the Dead, the ostensible conclusion to the “Living Dead” trilogy which emerged as one Romero’s strongest horror films to date. In 2004, Romero returned to familiar territory with “Land of the Dead,” a continuation of his zombie franchise long thought to be finished with “Day of the Dead.” This time, however, Romero increased the energy with a fast-paced actioner that was not shy on the gore and violence, pleasing both fans and the uninitiated. “Land of the Dead” ended up being one of the best reviewed films of the 2005 summer! He continued his zombie revitalization with “Diary of the Dead,” which was more of a reboot than a sequel to the other four movies in the “Dead” series. He then made the sixth in the series, “Survival of the Dead” (2010), which saw the inhabitants of an isolated island off the coast of North America conflicted whether to kill their own relatives rising from the grave, or try to find a cure. Romero’s “Dead” films continue to inspire such hits as “Shaun of the Dead” (2004) and “Zombieland” (2009). In 2013, Romero’s “Empire of the Dead” was announced by Marvel Comics. It was a 15-issue limited comic book series which began publication in 2014, and ended in late 2015. “Empire” features zombies similar to those in his “Living Dead” film series, but differs slightly because vampires are also part of the story. Dubbed the “Godfather of Zombie Films,” George A. Romero was a pivotal figure in the development of the contemporary horror film and the progenitor of the zombie apocalypse subgenre. Filmmakers who consider Romero as one of their influences include Frank Darabont, Guillermo Del Toro, Robert Rodriguez and Quentin Tarantino to name just few! Sadly, Romero passed away on July 16, 2017 from a brief, but aggressive battle with lung cancer. He slipped away listening to the score of “The Quite Man,” one of his all-time favorite films, with his family by his side. He leaves behind a filmmaking legacy that has endured, and will continue to endure, the test of time! Join Prospect House Entertainment, Glendale Arts and Chris Roe Management, along with George A. Romero's close family and friends, as we celebrate the life and career of the legendary horror filmmaker, who passed away on July 16th, 2017 at the age of 77. Romero, who pioneered the zombie film genre with the 1968 feature, Night of the Living Dead, made an indelible imprint on the industry and inspired a multitude of influential directors and actors. Help us celebrate his legacy with a Q&A with celebrity fans and friends, followed by a screening of George’s classic Warner Bros. film Creepshow, starring Ed Harris, Ted Danson, Leslie Nielsen, Stephen King, Hal Holbrook, and Adrienne Barbeau, among others. Red Carpet and VIP Reception – 7 p.m.
Q&A and Screening – 8 p.m.
VIP tickets are $50 per person and include a VIP reception at 7 p.m. and preferred seating. GA tickets are $30 per person. Tickets are available for purchase online at www.alextheatre.org. Based in Las Vegas, Prospect House Entertainment specializes in high quality Feature Films, Stage Musicals, and Documentaries. Prospect House Entertainment’s goal is to produce projects of distinction and innovation that maintain integrity and excellence. The company strives for originality, seeking out true and untold stories of social relevance to bring to the screen from around the globe. The team understands the power of the media and the images and messages it can instill worldwide. Found Footage 3D on Shudder- in 2D TODAY and 3D on 10/26! Just in time for Halloween, Shudder, the premium thriller, horror, and supernatural streaming service backed by AMC Networks, releases the 2D version of the upcoming Shudder Exclusive film FOUND FOOTAGE 3D!Following last week’s premiere of Seoul Station, the animated prequel to Train to Busan, FOUND FOOTAGE 3D is the latest Shudder Exclusive to premiere in October. 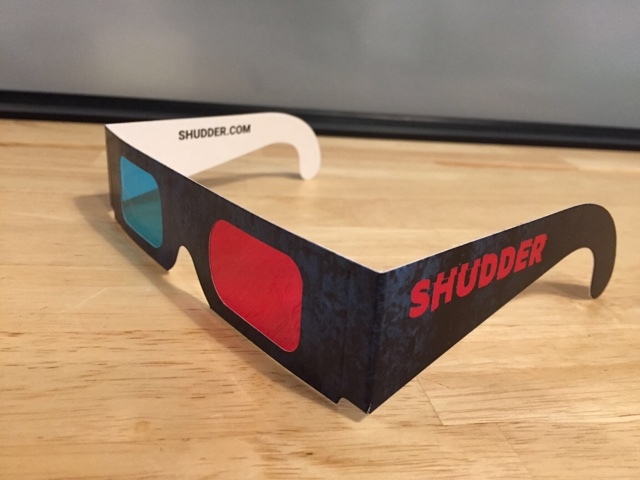 In anticipation of the 10/26 premiere,today marks the launch of Shudder’s free 3D glasses promotion. SAN CLEMENTE, CA (October 10th, 2017) – Stance in partnership with Warner Bros. Consumer Products, presents theLegends of Horror collection just in time for Halloween. 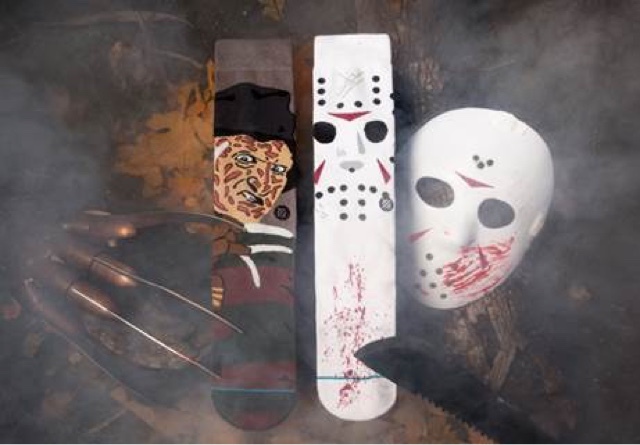 The collection features Jason Voorhees from Friday the 13th and Freddy Krueger from A Nightmare on Elm Street on Stance’s classic styles and signature caricature designs. The Jason Voorhees style features the iconic hockey mask with red blood-like splatters on a white base while the Freddy Krueger style takes on the army green, red, and grey palette of Freddy’s iconic attire. Both styles are made on Stance’s 200 needle construction and retails for $18. The Legends of Horror collection is available today at stance.com, Stance’s flagship location in Soho, NY, and select retailers globally. To keep up with Stance, follow @stancesocks on Instagram for the latest news. Embracing “The Uncommon Thread” as its mantra, Stance turned one of the world’s most boring accessories into its most exciting in less than five years. Stance’s founders saw a category that had been ignored, taken for granted, looked over, dismissed. By breathing life into something that had been overlooked, Stance ignited a movement of art and self-expression that has drawn athletes, performers and iconic cultural influencers to the brand – a group they call the Punks & Poets. And by underpinning its creative roots with a relentless focus on technical innovation, Stance is now found in over 60 countries on the feet of those who dare to be different. 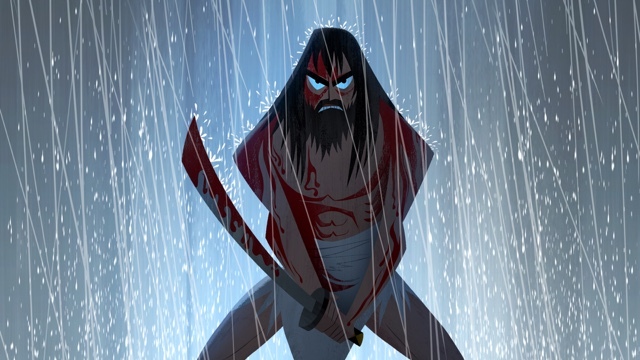 DENVER – September 18, 2017 – Created by famed animation director Genndy Tartakovsky, the fully remastered EmmyTM nominated premiere movie from acclaimed Season 1 of the Adult Swim series, Samurai Jack, will debut for the first time in remastered HD when “Samurai Jack: The Premiere Movie Event” arrives in movie theaters nationwide. Good. Long, but I cannot say anything bad about it. I guess it is about as good as the original, but I still like the first one more and felt the sequel was as necessary as finding out who the space jockey was in Alien. Nothing is better than what your imagination brings to light. Sometimes less is more. FOR IMMEDIATE RELEASE, LOS ANGELES, CA, October 5, 2017 — The American Film Institute (AFI) Board of Trustees announced today that actor, director, writer and producer George Clooney will be the recipient of the 46th AFI Life Achievement Award, the highest honor for a career in film. The award will be presented to Clooney at a Gala Tribute on June 7, 2018, in Los Angeles, CA. The AFI Life Achievement Award Tribute special will return for its sixth year with Turner Broadcasting to air on TNT, followed by encore presentations on sister network Turner Classic Movies (TCM). 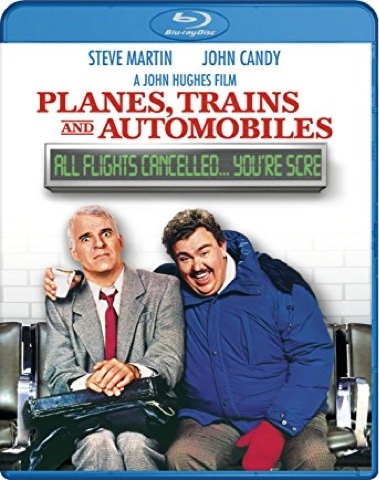 Audi and VIZIO return as Official Sponsors of the event. George Clooney is one of Hollywood's most dynamic multi-hyphenates, a presence bigger even than his movies. With an instantly recognizable charm, he has captivated audiences in front of the camera, and defined a cinematic voice all his own behind it — all while using his global voice to shine light on issues of human rights, climate change and more. Throughout a career spanning screens big and small, his work has earned him eight Academy Award® nominations and two wins — with nominations in the most categories ever. He won an Oscar® for Best Supporting Actor for SYRIANA (2005), and went on to earn Best Actor nominations for MICHAEL CLAYTON (2007), UP IN THE AIR (2009) and THE DESCENDANTS (2011) — all films grounded by his signature charm, and his universal relatability. Clooney is as accomplished a filmmaker as he is a performer, from his directorial debut CONFESSIONS OF A DANGEROUS MIND (2002) to his multiple-Oscar®-nominated GOOD NIGHT, AND GOOD LUCK. (2005) and THE IDES OF MARCH (2011). He earned a Best Picture Academy Award® for producing ARGO (2012). On screen, he continues to deliver performances that are moving, humorous and human, with additional acting credits including: OUT OF SIGHT (1998), THREE KINGS (1999), O BROTHER, WHERE ART THOU? (2000), the OCEAN'S trilogy (2001, 2004, 2007), SOLARIS (2002), BURN AFTER READING (2008), FANTASTIC MR. FOX (2009), GRAVITY (2013), and HAIL, CAESAR! (2016). His latest project is SUBURBICON (2017),which he directed, and also co-wrote alongside his frequent collaborators the Coen brothers. In 1984, Clooney landed his first major role on the TV sitcom E/R — not to be confused with the long-running hospital drama, ER, that would later make Clooney a household name. Early TV credits included popular series such as THE FACTS OF LIFE and ROSEANNE, and bit parts on MURDER, SHE WROTE and THE GOLDEN GIRLS. 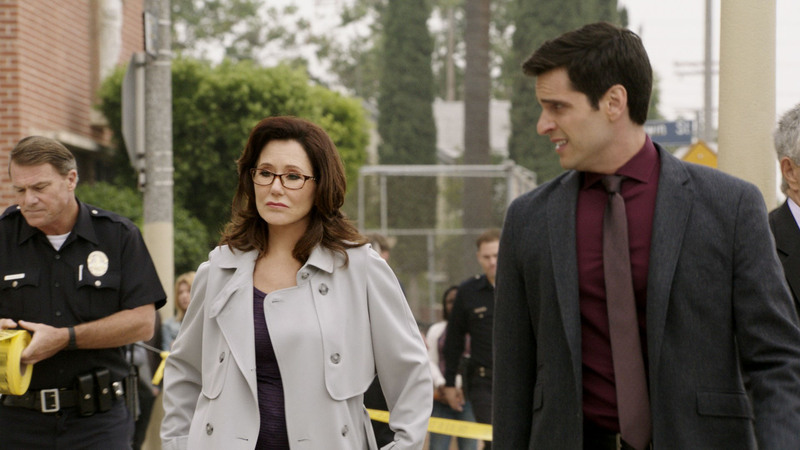 His breakout as Dr. Doug Ross on ER earned him two Primetime Emmy®nominations for Outstanding Lead Actor, and led to high-profile film roles in FROM DUSK TILL DAWN (1996), ONE FINE DAY (1996) and BATMAN & ROBIN (1997). His starring role in the film OUT OF SIGHT marked the beginning of a long-lasting collaboration with one of our greatest filmmakers, Steven Soderbergh, on films including the OCEAN'S trilogy and THE GOOD GERMAN. In 2000, he starred in the Coen brothers' O BROTHER, WHERE ART THOU?, forging another iconic collaboration that continued with INTOLERABLE CRUELTY (2003), BURN AFTER READING and, most recently, HAIL, CAESAR! In 2006, he established his reputation as a filmmaker with a distinctive vision when he was nominated for Best Director and Best Original Screenplay for GOOD NIGHT, AND GOOD LUCK. — the same year he received his Oscar® for SYRIANA. Most recently, the 45th AFI Life Achievement Award Tribute gathered American film’s finest to honor Diane Keaton on June 8, 2017. Surprise attendee Woody Allen presented the Award to Keaton. The event brought to the stage seven previous AFI Life Achievement Award honorees as performers and presenters: Warren Beatty, Jane Fonda, Morgan Freeman, Steve Martin, Al Pacino, Meryl Streep and Sidney Poitier. Additional presenters who paid tribute to Keaton included Lisa Kudrow, Rachel McAdams, Martin Short, Sarah Silverman, Emma Stone and Reese Witherspoon.